Toaster Oven Roasted Green Beans. Sweet, spicy, crispy and crunchy! Quickly add a delicious and healthy vegetable side dish to your next holiday meal or weeknight dinner. The table feels empty, unfinished without them. Like a slice of naked pumpkin pie or mashed potatoes without gravy. 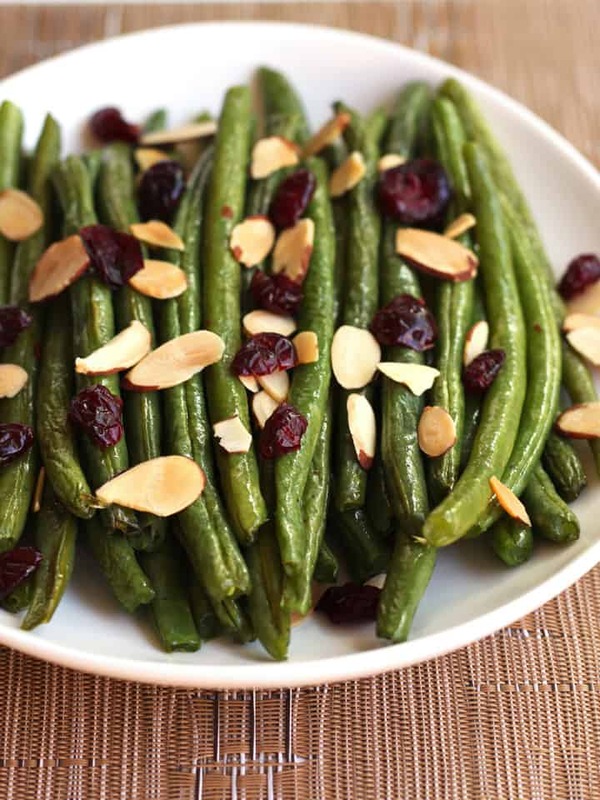 It doesn’t feel like a real holiday until green beans hit the table. Not just any kind, I mean good green beans. Were your childhood Thanksgivings punctuated by that icky gray soup and fried onion dish too? Memorable for all the wrong reasons. I hold it and my parents “two-bites-rule” responsible for putting me off mushrooms until I was 32. Had our holiday dinners included these toaster oven roasted green beans, I would have Cleaned My Plate and then fought my sister for seconds. 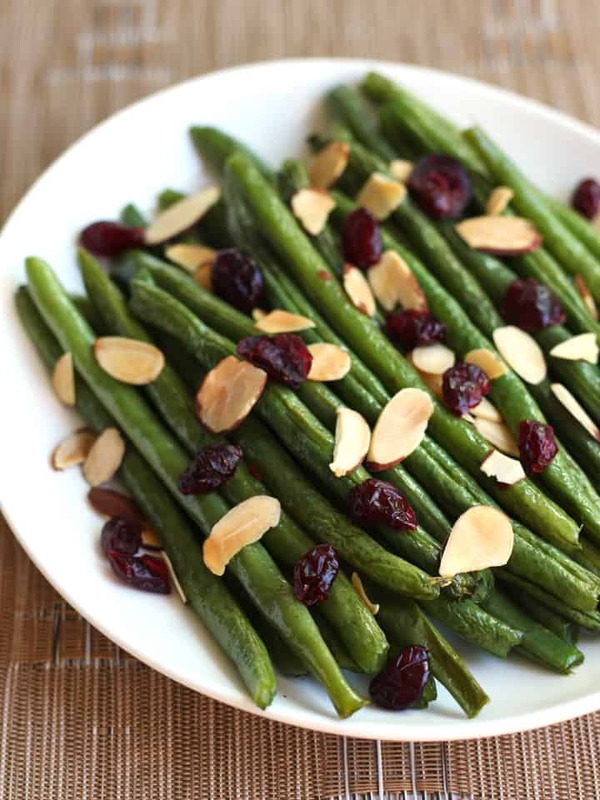 Lightly roasted in olive oil, with dried cranberries and toasted almonds…Veggie Perfection. The best tasting roasted veggies start as an even layer on a rimmed baking sheet. Green beans are delicious. So you’ll inevitably want to roast more than the pan that came with your toaster oven can handle. For smaller toaster ovens you can cook your beans in two batches or opt for an 8 x 8 metal baking dish or toaster oven – safe ceramic dish instead. 3-12-2017 Update: Glass dishes are not safe to use in a toaster oven. If you use the baking dish you will have to turn the beans more often during cooking. This helps to prevent the bottom layer from steaming instead of roasting. Drizzle the beans with a little oil and season simply with salt and black pepper. Surprise your guests with a pinch of crushed red chili pepper. The touch of heat is a nice counter to the sweet dried cranberries and nutty toasted almonds. Roasted green beans taste best if cooked until they are crisp-tender. Meaning they have softened but still retain a bit of crunch or snap when you bite into them. Look for your beans to be slightly shriveled with light caramelization or brown spots on them. Hands-down the best way to test if they are ready is to grab a green bean and take a bite! 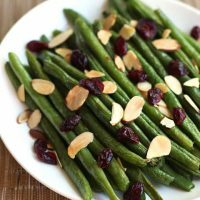 Right before serving, sprinkle your finished green beans with dried cranberries and toasted almonds. Then enjoy your healthy holiday side dish, memorable for all the right reasons. Sweet, spicy, crispy and crunchy! Quickly add a delicious and healthy vegetable side dish to your next holiday meal or weeknight dinner. Preheat toaster oven to 450 F. Wash and dry green beans. Snap off the ends on each bean and place them on a rimmed cookie sheet or in a baking dish. Drizzle green beans with olive oil, salt, pepper and red chili pepper. Toss to coat well. Roast green beans at 450 F for 14 to 19 minutes. Use tongs to turn the green beans halfway through cooking. Green beans will be done when tender to the tooth with a little crispness and snap left. 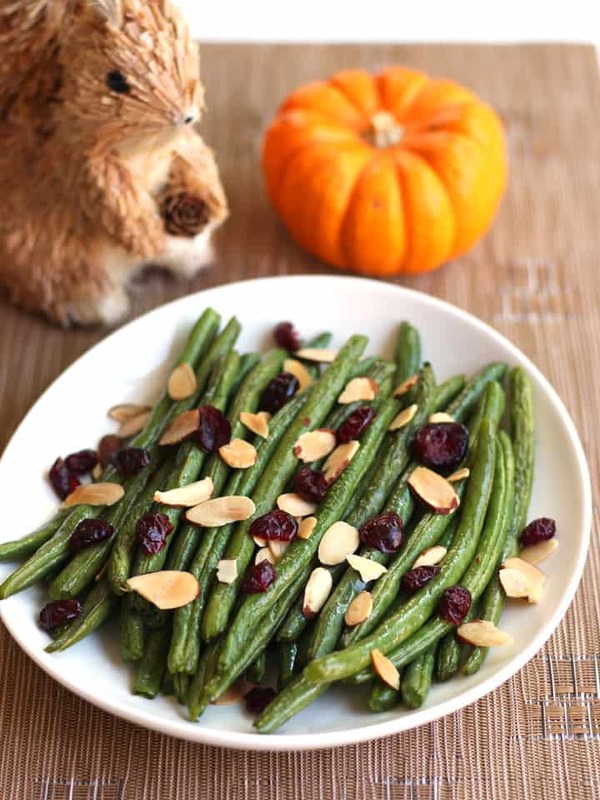 Serve warm green beans plain or topped with toasted sliced almonds and dried cranberries. If using a baking dish turn the green beans about every 5-7 minutes to help them roast and keep from steaming. If cooking green beans as a single layer on a cookie sheet start checking their doneness at the 14 minute mark as they will cook faster in a single layer.